Here are some tips on how I keep yogurt cool till lunch. Do you have a child who loves yogurt? I do, and until recently I didn't pack it in his lunchbox because I just didn't know "how" to keep it cool. It turns out I wasn't the only one. 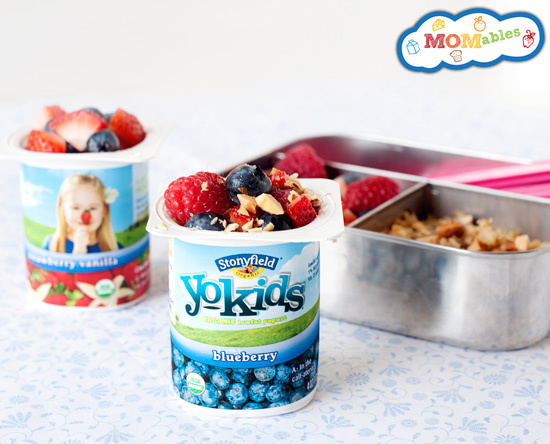 Each week, I receive dozens of emails from MOMables fans wanting to know how to pack yogurt in their child's lunch. Now that I've figured out how to pack my son's yogurt in his lunchbox, I'm no longer scared that it will go bad. If you wonder why I give my son a yogurt every day, it's because he is underweight. His doctor wants me to "supplement" his diet with one of those supplemental drinks but I rather give him a yogurt. Since he eats one yogurt a day, this is one item I purchase organic, with no artificial sweeteners or colors, no traces of pesticides, and from cows not fed GMOs or given antibiotics -this is my choice. I often pack an individual yogurt in his school lunch because of its versatility. It can be a sweet and simple treat by itself of parfait-style with mixed berries and crunchy granola, like the recipe below. Alternatively, you could purchase a large tub and put it in a thermos, but his little hands cannot open the thermos unassisted, so this is the best option for him. Packed with protein, calcium, potassium and probiotics, yogurt is the perfect creamy treat to simultaneously satisfy his appetite. I know many of you are wondering how I pack it in the lunchbox. As with any perishable food, yogurt should be kept cold from the time you take it out of the fridge till lunchtime. So here are some tips on how I keep them cool till lunch. I live in the south where we have high temperatures nine months out of the year, so keeping food cold is important. 1. Use an insulated lunch box or bag. Although the insulated material itself won't keep your yogurt cool, it helps reflect the cold temperatures from any frozen or chilled items you've tucked into the bag -- maintaining a safer environment inside the lunch box for your perishables. 2. Pack yogurt cups next to a frozen gel pack or inside a freezer koozie (also called can coolers). This will help keep the yogurt chilled through lunch. 3. Toss the yogurt in the freezer for 20-30 minutes in the morning. I've made it a habit to put the yogurt in the freezer while I drink a cup of coffee, get the kids dressed, and everyone out the door. Again, his yogurt is the last thing I grab before I zip the lunch bag closed. If you are thinking that you'll forget to grab it... I have a post it inside his lunch bag that says "yogurt" so I see it before I zip it closed. 4. Toss yogurt tubes in the freezer the night before. They'll be frozen by morning, so just slip one into your lunchbox before leaving the house. By lunchtime, the frozen tubes will be thawed out and still chilled. 5. Freeze a water bottle to serve as an icepack. If you often send a water bottle in your child's lunch, consider freezing the bottle so it keeps the inside of the lunch bag cool. 1. 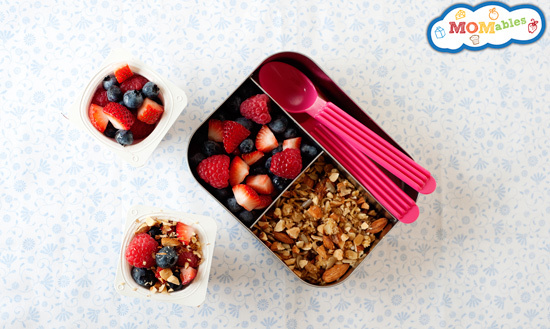 Pack granola or cereal in a small lidded container. These crunchy add-ins are a perfect complement to any yogurt parfait. But if you add them to your yogurt while packing your lunch, they'll be soggy by lunchtime. 2. Pack berries in a separate lidded container.